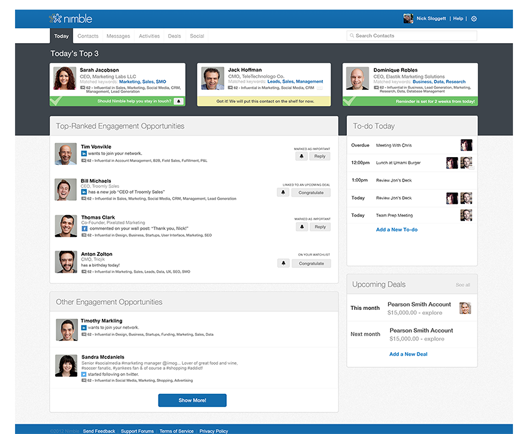 With a name like Nimble – its product better be quick, agile and smart. And anyone logging into this social CRM for the first time will quickly see how Nimble lives up to its namesake and more. For the unacquainted, Nimble helps professionals build better relationships by providing context to conversations through actionable insights, including notifications across social networks that are important for users to act upon, making relationship building using social media easier. This updated homepage, dubbed the Today Screen, gives users immediate access to the intelligent opportunities Nimble uncovers daily like contact’s birthdays and job changes, impending deals, social influence and more. 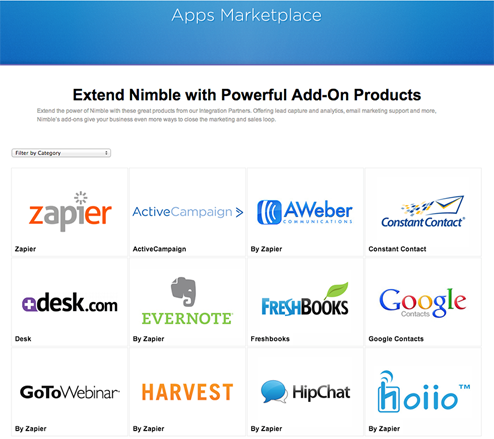 Nimble 3.0 is complete with more than 100 new integrations with services like ExactTarget, Constant Contact, Netsuite and others. 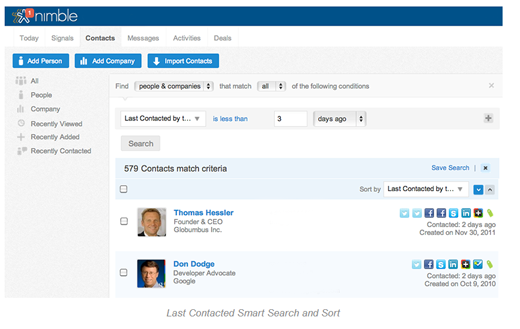 Nimble’s search can keep an individual and their colleagues on the same page, as users can sort by last contacted (people and companies), so they always know who, when and on what channel a prospect was contacted.